You are here: Home / Uncategorized / Ya tenemos 6 meses! I can’t believe last week I passed the six month mark since I began The Other Side of The Tortilla. 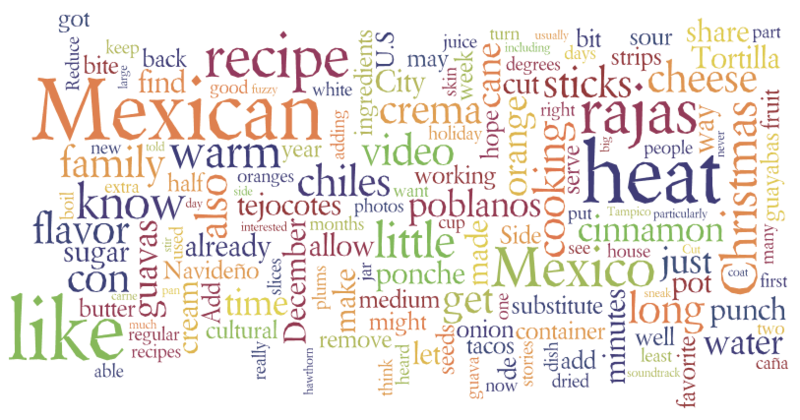 It feels like only a short time ago that I started contemplating how to share my quest for Mexican culinary and cultural nirvana in the kitchen. Thank you so much to those of you who have become big fans along the way; I appreciate your loyal support, feedback and passing my site on to friends and family via word of mouth (or email…or tweet…or Facebook). My goal with the site is not just a personal one to chronicle all I’ve learned from family, friends and cherished cookbooks about traditional Mexican cooking in order to someday pass the wisdom down to my own children; I also want to help educate others about Mexican cuisine and culture. I’m always open to suggestions for improvement or new elements you’d like to see, so please hit me up via the comments or by emailing me by clicking on the contact section to the right if you’d like. I frequently get comments via email in both languages, which I think is so cool. Thanks to all you wonderful readers, I’ve already gotten some great suggestions on how to enhance your experience here on The Other Side of The Tortilla. You can expect to start seeing a little bit of video here and there very soon. One note: I do moderate the comments only for purposes of keeping my site free of spam, but I make a conscious effort to approve legitimate comments as soon as possible so we can have a lively discussion. To commemorate this little 6-month milestone anniversary, I created a graphic using words that have commonly appeared in my posts since I started back in August 2009. The more frequently a word appears in posts from the last six months, the larger the font size. I hope you have as much fun looking at it as I have! When it’s quiet around here, it can only mean one of two things: I’m either busy in the kitchen or writing and revising new recipes. Lately, I’ve been busy with a bit of both. If you follow me on Twitter, then you already know that I often post photos taken on the fly in the kitchen; if you didn’t, you do now, so head over and follow me there if you’d like some sneak peeks every now and then. Most commonly, people have been telling me I’m making them hungry, so I must be doing my job well, right? Also, I’ve recently been asked to write a guest post about why native foods are such an important element of cultural bonding (both in adult-to-adult and adult-to-kid relationships) at SpanglishBaby.com, a parenting site for raising bilingual kids. I’m very excited to be able to contribute over there and will cross-post my article here on the Tortilla later this month. They found me thanks to someone passing on the word about the blog. I’m also honored to have been mentioned on The Tiki Tiki Blog in their weekly El Buzz section as a blog to watch a few months back and hope to contribute a thing or two over there in the coming months. So again, thanks for reading. I hope you will continue to enjoy my adventures in the kitchen and will share the site with a friend or two. If you like the wordle image above, you can make your own by going to wordle.net. The custom color palette was created with colors from photographs that appear or are scheduled to appear here on The Tortilla. Congratulations on the six-months mark!! I´m happy we finally found you and even happier you will write a guest post for us! Can´t wait for all the yummy things you have in store for your blog. Everything is so well done and beautiful. Felicidades! Hi Maura, My uncle lived in Mexico and I visited a few times. I love those flautas and the real taste of those tortillas Mexican style. Of course, I would always love a true gaucamole recipe. Happy cooking! Blanca, flautas are on my to do list! And I’ve got some plans for guacamole now that I recently got a new molcajete.